What is it that I make? I’ve been wondering for a while what it is exactly that I make – ‘I’ here being that particular persona within the constellation that is called ‘myself’, the one who works as ‘an artist’? We are all, I belief, creative with regard to our own lives. (Which is what I think Joseph Beuys meant when he said: “Everyone is an artist”). But creating one’s life isn’t quite the same as ‘making art’. For example, part of my life has been about creating and bringing up children. There’s obviously no art to making children, although like art chance and imagination can play an important part in this, but there’s certainly a difficult and uncertain art in trying to bring them up as half-decent human beings. Two thoughts stay with me that relate to all this. One is that the art lies in our attending, our noticing, both with respect to an act of making and then to what is made. This doesn’t take anything away from the business of working with materials or reduce art to conceptualism. It just inflects things a little differently. Working ‘as an artist’ I try to make a compelling image – something richer, more ambiguous and more sensuous than a concept – that I hope others will want to attend to. I used to do this mostly with paint on canvas and then with a mixture of words and images on paper that became books. But the times have made me wonder whether this is the best use of my skills which now, late in my life, seem to stem as much from the work I have done as a teacher as in the making of physical artefacts – drawings, photographs, enamel objects, books, whatever. The other thought is that as a teacher I perform images – finding or borrowing the right words in the most compelling pattern at the right time, all so as to catch and redirect the attention of others. For brief moments in a conversation I actively sculpt words in the air and, on a good day, in such a way that people attend and take something from those brief word patterns into their hearts and minds, into their lives. This patterning of words in the air often has a particular aim, to try to facilitate the reordering of the world by drawing attention to different patterns of meaning, different ecologies of thought and action. It seems I am spending more and more time making new patterns – often out of the very old ones we’ve chosen to forget. What does this make the part of me I have habitually called an artist? Am I now an artist/teacher, a performer, or just somebody who ‘chats’, a momentary patterner of empty air? I’m increasingly unsure as to how best to answer that question. What I do know is that a lifetime’s engagement in and understanding of art is quietly unravelling, slipping away from me as the tide of my life and the pressing issues of our times push me off in quite another direction, towards a task that as yet seems as nameless as it is uncertain. This entry was posted in Provocations on June 30, 2013 by Iain. “Recently the Irish artist Pauline O’Connell described herself, in a barely ironic tone of voice, as a ‘composite cur’. She was referring to the unexpected abilities needed to complete her Drawing the Water project – abilities that far exceeded those conventionally identified with art practice. We know that dogs range from ‘best of breed’ – the product of an economics of exclusivity – through to ‘composite curs’, sometimes valued for their adaptive intelligence and multiple skills. ‘Best of breed’ dogs exist to exemplify a rarefied category set up by the Kennel Club and might serve as an allegory for our hyper-specialized disciplinary culture. ‘Composite curs’ don’t exemplify anything. They thrive on responding to contingency, perhaps reminding us that, in Geraldine Finn’s words: ‘we are always both more and less than the categories that name and divide us’. My assumption here is that, as with dogs, so with people”. I very much enjoyed working with the group of people selected by Simon Read, Ralf Nuhn, Sue Tapsell, Simon McCarthy (Middlesex) and Chris Wainwright (University of the Arts), since we all had a real interest in the way in which the arts might be used to engage the public more effectively with issues of flooding and climate change more generally. By helping to bring people in the arts into a practically-focused dialogue with hydro-social issues, the organisers have now created a more practical and productive relationship between water professionals, academics engaged in water studies, and appropriate artists. The event was very positive, with internationally-established artists like Lillian Ball, Tim Collins & Reiko Goto, and Simon Read providing examples of art-led engagement with environmental issues in general and hydro-social issues in particular. It was vital to the event that the attendees were from across the spectrum of possible interested parties – ranging from Tim O’Riordan (Emeritus Professor of Environmental sciences at the University of East Anglia), David Cross (of Cornford and Cross), Heather Shepherd from the National Floods Forum, Julie Steward (an artist working on local waterways), the geographer Caitlin DeSilvey, Antony Lyons (an artist and scientist who formally worked with the Environment Agency), and Fanshawe (an artist and environmentalist working with BirdLife International), in addition to academics and people from relevant national bodies. 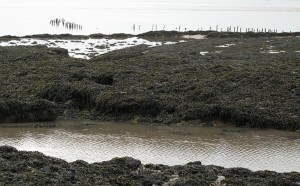 It is already clear that some of the links formed are likely to be practically productive and, in addition, reinforce and extend previously existing links in this field created by the PLaCE water seminar I organised with Steven Sodek – at that time in charge of flood policy for bristol City Council – Mel Shearsmith, and Victoria Walters here in Bristol in 2011. I am about to spend three days in London at a series of invitation-only workshops looking at: “the potential for the arts to enter into partnerships with scientists and flood risk and environmental management communities, social science and cultural geography communities, local, regional and national government organisations towards the development of both sustainable policy and practical application”. This event is organised in part by my old friend Simon Read, along with Ralf Nuhn, Sue Tapsell and Simon McCarthy from Middlesex University and Chris Wainwright at Chelsea School of Art. There are overlaps in core concerns with the Polar Cap conference in Edinburgh where I gave a keynote recently and it will be interesting to see how this London event compares. I have the greatest respect for Simon as an artist and environmental campaigner and an innate suspicion of the London art education world, so will be trying to see past my own presuppositions and see whether there are any real possibilities for ‘transversality’ to develop. My own short presentation is deliberately slightly provocative – a shorter and less nuanced version of the ‘ecosophical collaboration’ presentation I did in Edinburgh – and begins by picking up on Pauline O’Connell’s wonderful description of herself as a “composite cur”. Given that the original seems to have been very well received it will be interesting to see how the same approach goes down in the South East. This entry was posted in Projects on June 29, 2013 by Iain. I am going out to walk along part of the Severn estuary with Antony Lyons today to look at potential material for a film we are making on transgression (in the geological sense). This fits into Antony’s on-going work around water, climate change and sea levels, and the whole issue of time and change, ecologically speaking. Walking and talking is also always a good means of reflecting on, sifting through, and generally sharing and digesting thinking material. Today’s trip has a particular feel to it because my friend the artist David Walker-Barker has just agreed to send me a clip of something that provided perhaps the most extraordinary experience of the complexity of geological time I’ve every had. While we were talking in his studio in Yorkshire one evening, David handed me a very large quartz crystal and told me to watch it carefully as I tipped it from side to side. Almost miraculously, as I did so I saw a small bubble of gas move in its liquid heart, much like the bubble in a spirit level. The paradoxical tension between the age and solidity of the crystal and that movement has always remained with me, as mysterious as the viral matter – inert but with the latent potential for life – that makes up part of the DNA of every human being. This entry was posted in Projects on June 10, 2013 by Iain. Pauline O’Connell and I met yesterday to discuss her new project – I am acting as a mentor for its early stages. I’m very pleased to be able to do this (it would be great if ACE funded mentorships in this way) and am very much looking forward to seeing how the project – which concerns a publicly-owned field – plays out. This entry was posted in News on June 5, 2013 by Iain.